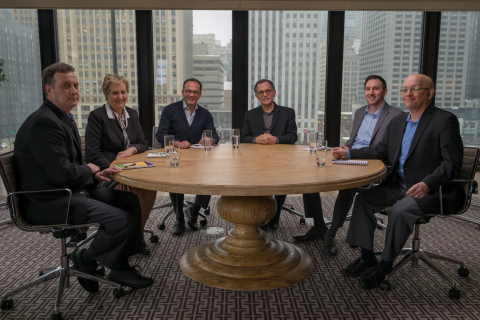 Daylight, views of the outside, and control of light levels are essential parts of human centric lighting, which should be a major factor in designing workplaces, according to expert panelists at the Human Centric Lighting Roundtable hosted by Lutron, held December 14, 2018, in Chicago. Expanding on such concepts as the power of daylight, the role of smart technology and the increasing use of full-spectrum color and white tuning, the panelists discussed how a focus on human centric lighting can be instrumental in enabling enhanced well-being and happiness, making spaces more attractive for employers, workers, and customers. “Human centric implies that we're designing light to really enhance health, well-being and productivity,” said Vivian Loftness, professor of architecture at Carnegie Mellon University, noting that daylight and personal control can make a profound difference in people’s experience of the built environment. In addition to Loftness, the panel included lighting designer Randy Burkett of St. Louis-based Randy Burkett Lighting Design; architect Gary Bouthillette of Los Angeles’ IA Interior Architects; Arturo Banuelos, managing director with the property management firm JLL; and building science specialist Brent Protzman of Lutron. The panel was moderated by Reed Kroloff, principal at jones | kroloff. The importance of quality light. Thanks to inexpensive and easily accessible technology, modern lighting can be precisely tuned to specific color temperatures and changing intensities while still maintaining a high CRI (color rendering index), a measure of color fidelity. All of these attributes help contribute to occupant comfort and space attractiveness. “This is a huge leap in the lighting world that has allowed us to do much more customized design,” said Loftness. A definition of human centric lighting. The panelists observed that human centric lighting touches on a variety of elements, including quality of light, the ability to control light, and biophilia – a human connection to nature, which includes views of the outside and incorporation of natural light. “It's just being sensitive to human needs and human desires, whether it's in an office space, in a hospital, in a classroom or out for a good night on the town,” said Burkett. Bouthillette added that lighting designers should be brought in at the beginning of the process. “It has to be a holistic solution,” he said. You can watch the video and learn more about how Lutron illuminates the human experience at lutron.com/HumanCentricLighting.